How well are companies managing the change when warehouse technology is introduced? There is room for improvement. In many cases, companies are not investing the time and money required to maximize the significant advantages of automating manual processes. Management does a poor job of viewing the technology from the worker’s point of view. They see investments in technology as a positive thing and assume warehouse staff will, as well. Therefore, they don’t spend enough time explaining the “why” – the big picture rationale and what the company hopes to achieve. The fact is, putting an RF gun in someone’s hand slows them down – at least initially. There can be a 4-6 month learning curve on some new processes. Associates need to know this. Without proper training, staff will continue to resist the change, either overtly or subconsciously. Was it really an accident the forklift ran over the RF gun? Speaking of training, how important is it to the success of these implementations? It’s critically important. I advise clients to double the training budget for new technology implementations. But too often, here’s what happens. Cost conscious managers ask the technology supplier: “Is there anything we can do to bring down the cost?” Well, the tech costs are fixed so, invariably, the supplier suggests skinnying down the training budget through “train the trainer” and other shortcut approaches. But you don’t learn to tie your shoelaces after one demonstration, and learning new procedures is no different. It requires repetitive reinforcement. Hard dollar savings from training shortcuts pale in comparison to the loss in productivity experienced as associates struggle to embrace new technology. When companies skimp on warehouse training, does it always come down to cost reduction? It’s cost and a perceived lack of time. The thinking is “We can’t afford 4 hours of training today; we need to get the orders out.” But proper planning can address this concern. It always amazes me that companies don’t have the time to do it right the first time, but have lots of time to repeatedly correct problems over months and months until they finally get it right. Are there workers who simply can’t make the transition? At one recent installation, I heard of a person who got so frustrated he quit after 25 years on the job. That’s a rare example, but management needs to recognize that change is hard and ease the transition through clearer communication and training. You can’t just dump technology in people’s laps and walk away. Millennials tend to have an easier time with this type of change. Those who struggle may not even have a computer at home. It sounds like your saying that companies need to be “all in” on the technology implementation and commit to doing it right. Sure. Why bring in warehouse technology just to say you’ve done it? I worked with a client recently that introduced RF scanning to a manual environment, but they tried to do it on the cheap. Their handhelds were smaller than a smart phone and came with a stylus for keying in data. The operation did not spend for electronic advance shipping notices (ASNs). For inbound receipts, workers had to enter 85 characters per pallet into the handheld using the stylus in order to create labels. How is that going to improve accuracy and efficiency? What tips do you have for companies introducing new technology to warehouse processes? Well, certainly provide staff with the broader context for the change and the critical role they play in moving the company forward. And, as I said, spend more for continuous training. 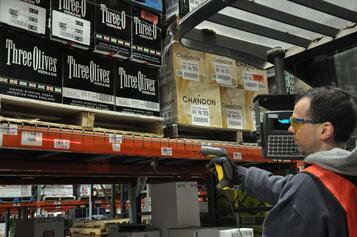 Another success driver is to leverage the role of warehouse management. Too often, I see supervisors tied to a desk rather than on the floor. Because management has cut clerical staff, supervisors are stuck doing paperwork or attending meetings, when they should be walking the floor and observing. Warehouse leads become de facto supervisors and you end up paying experienced supervisors to do clerical work, when they should be spearheading these implementations. Fred Kimball’s firm, Distribution Design, provides distribution consultant analysis and design services for operational improvement, warehouse management systems, facility layout, and material storage & handling systems.